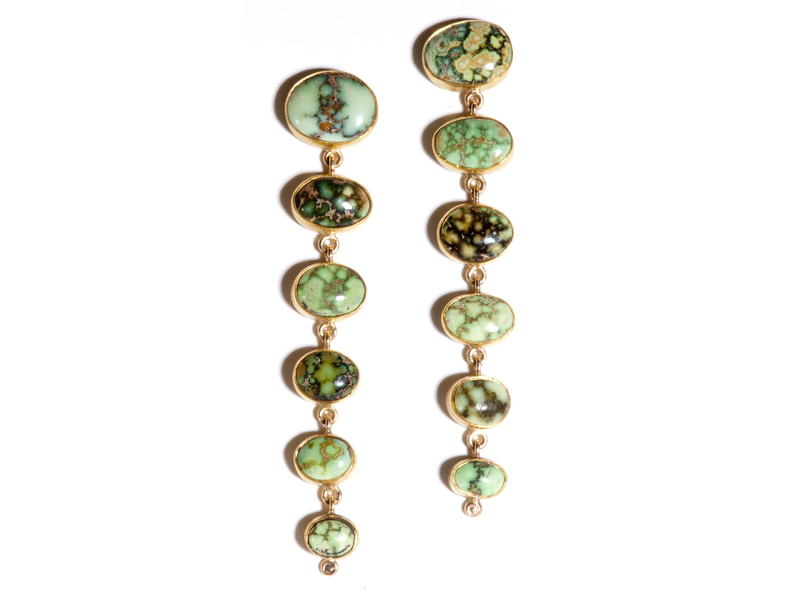 Gold Natural Damele Turquoise Dangle Earrings handmade by Santa Fe artist Miles Standish. This stunning 6 stone dangle earring features beautiful pieces of damele turquoise set in 22 karat yellow gold and 18 karat yellow gold. The earrings measure 2 3/4″ inch long by 1/2″ of an inch wide. The Damele mine is a small, tightly run operation, located thirty miles northeast of Austin, Nevada. The mine is located next to the Godber-Burnham mine, on The Dry Creek Ranch owned by the Damele family. There, they raise unique horses that carry the Damele name. Benny Damele discovered the mine sometime around 1973. Soon thereafter, Clyde Wright became involved in mining the claim and worked it for approximately 18 years. Tony Cotner, a shrewd merchandiser and colorful character, has owned the claim since 1990 when he bought it from Benny Damele. Cotner, also known as “Mean Green”, states there is an ancient subtropical zone located beneath the mine that may be responsible for the unusual colors associated with Damele turquoise although he is unsure whether the organic environment has anything to do with the coloration. Damele is a well known mine, distinctive because it is one of the few turquoises that can be truly yellow-green, either from iron or environmental conditions, but without zinc. Turquoise from the Damele mine is wonderfully distinctive; very hard, and visually appealing. It forms in veins and occasionally as nuggets in carbonaceous chert and also diatomaceous earth. Much of the production from this mine is a high grade variscite, a “first cousin” to the turquoise. The mine is extraordinarily versatile, it’s colors ranging from pure lime-green through bright chartreuse; it can also be yellow with black webbing, or white, orange and brown, or even a caramel color with bright green polka dots. The mine also produces small black nuggets with bright yellow-green bumps poking out of the black matrix. It’s availability is extremely limited because the mine is small and difficult to work. Due both to its limited quantity as well as its rare color and quality, turquoise from the Damele is an exceedingly collectible turquoise. 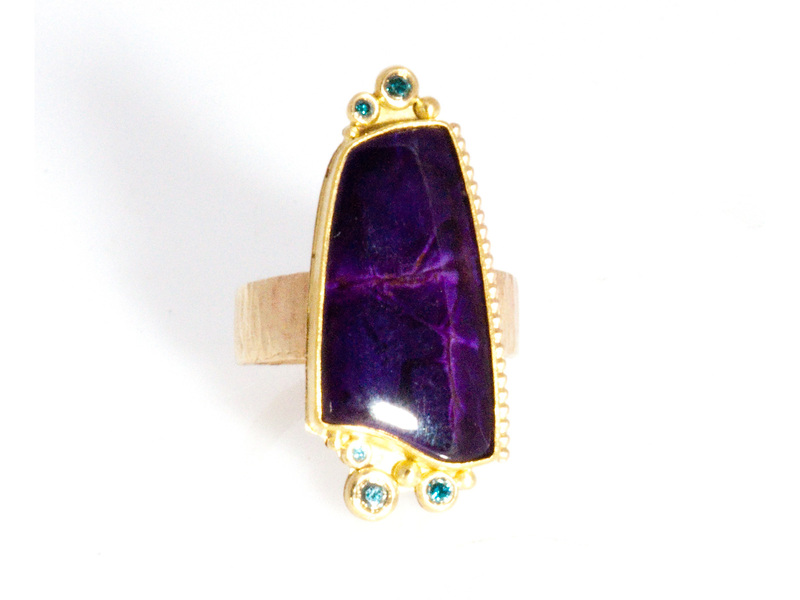 As a jewelry artist and craftsman, Miles Standish says he finds meaning in formulating shape out of something shapeless and bringing together different elements to create a relationship of balance and wholeness. 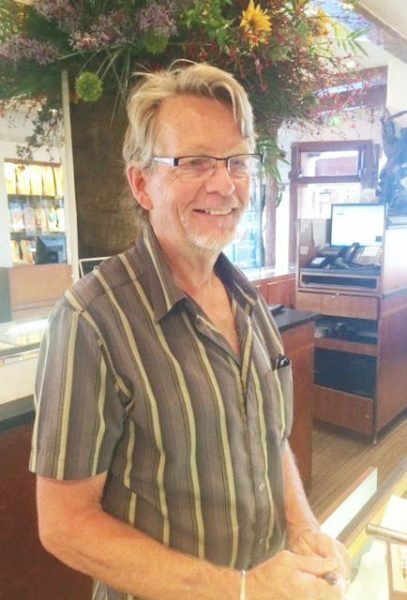 A long-time resident of Santa Fe and a National Forrest Service employee, Standish draws his inspirations from observing the natural world: the shapes of clouds, the curve of a leaf, the spread of a bird’s wing, the texture and pattern of a sea shell. Growing up, Standish was encouraged in every artistic endeavor but didn’t begin silver-smithing until the age 20. “I sometimes feel as though the silver chose me; I did not choose it,” says Standish. 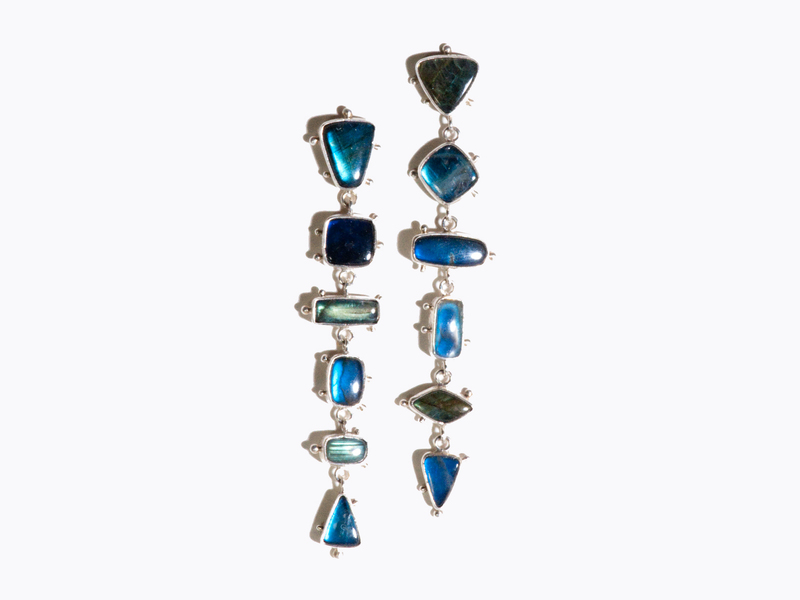 Presently working in gold, silver and a variety of precious and semi-precious stones, Standish is known for his original and innovative designs, artistic expression and outstanding craftsmanship.